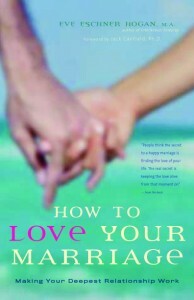 Eve Hogan is a prolific writer and the author of several books related to personal and spiritual growth. Read below for descriptions, and click the photo to order from Amazon, click on the paypal link for autographed copies direct from the author. Spiral Labyrinth Calendar 2018 NOW Available! 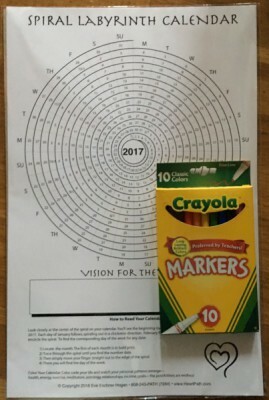 The Spiral Labyrinth Calendar offers a unique perspective on time and provides a wonderful tool for tracking your own personal patterns. While most calendars show time in isolated chunks with no connection to the past or the future, the Spiral Labyrinth Calendar reveals a journey through time, each month—and year—connected to the next, continuously. Color code your calendar, create your year. 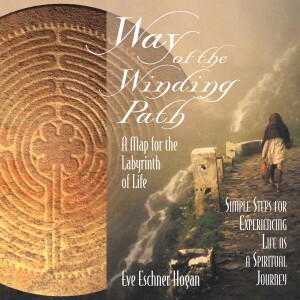 Winding Path: A Map for the Labyrinth of Life Using the Chartres Cathedral Labyrinth as a guide, Eve shares with the reader simple steps for expanding the boundary of the labyrinth and experiencing life as a spiritual journey. She explains that the labyrinth is the perfect laboratory for practicing essential life skills so that we may apply them in all areas of our lives. You know how people often choose partners by “looks good and feels good” and then wake up in relationships that aren’t good?! Intellectual Foreplay is the perfect tool for helping you to make the right choice of partners, avoid the wrong partners or improve the relationship that you’re in by deepening your intimacy and communication! Rings of Truth, Co-authored by Jim Britt and Eve Hogan You won’t be able to put this book down! Ever get stuck in a pattern of holding onto the past or living for the future, missing the joy of the present moment completely? Rings of Truth will guide you on a journey that will teach you the art of self-observation, letting go and regaining a resourceful (once again-full of-Source) life. Rings of Truth combines the mystical with powerful universal truths in a heart-warming story guaranteed to wake-up your soul. 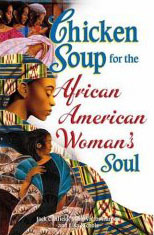 Chicken Soup for the African American Soul (Eve was the Senior Editor) While the stories in this book were written by, for and about African Americans, the impact and power of this book is for everyone! Heartwarming, enlightening and educational. 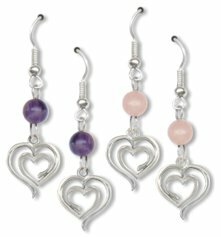 Necklaces, Earrings and Bracelets are available. I then turned it completely upside down to discover the feminine attributes of breasts and buttocks, attributes of the Divine Feminine, God in the form of the Mother. Feeling quite blessed, I knew this symbol had already been divinely created, my job was solely to re-discover it. The Peace Starts Here variation was created as part of a movement to remind people that Peace is an inside job… so this logo reminds you to journey into your own heart to find peace and bring it back out into the world with you…. 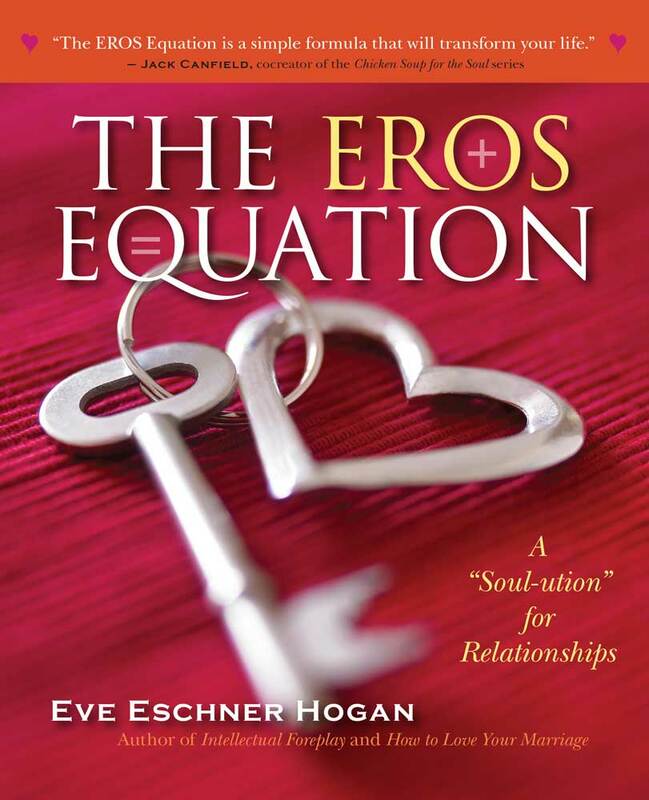 The EROS Equation: A SOUL-ution for Relationships! 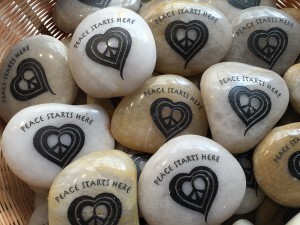 Einstein said, “You can’t solve problems from the same mindset that created them.” Consequently, we must learn to access a different part of ourselves if we are to resolve problems. The EROS Equation provides the tools and skills needed to achieve self-mastery and to transform your relationships. How to Love Your Marriage: Making Your Closest Relationship Work While Eve’s first books helped people find love, this one helps them to keep the love alive and thriving. Eve explains that true love never really goes away, but access to that love gets blocked by unresolved experiences, beliefs, and comments. By learning to break through these barriers (or keeping them from rising in the first place) you will be able to revitalize and renew the love within your marriage. Whether you are just starting out in married life, have been married for many years this book will offer you wise advice and support for creating a lasting, healthy, joyful marriage. Virtual Foreplay: Making Your Online Relationship a Real-Life Success The Internet has brought us the technology to make great introductions, but do we have the skills to turn those introductions into lasting, joyful relationships? Virtual Foreplay will show you how! Virtual Foreplay can transform your online hope into offline love! With over 15 million people looking for love online, there is just no reason to be lonely! Chicken Soup for the Ocean Lover’s Soul This book is full of inspiring Sea Stories and Wyland’s artwork. Eve Eschner Hogan is a contributor of two stories selected for this publication: “Octopus’ Garden” and “Ebb and Flow.” Eve is an avid diver and co-owner of Makena Coast Dive Charters on Maui. Chicken Soup for the African American Woman’s Soul Whether you are a mother, daughter, grandmother or girlfriend, these stories of trial and triumph will encourage and inspire you as you feed your soul and soothe your spirit. This candid, touching and inspiring collection of stories proves that the spirit of sisterhood extends beyond geography, economics, age and time. Whether we’re passing on family traditions, keeping the faith or just keepin’ it real, one thing is for sure; we are here because of the shoulders of we stand on. 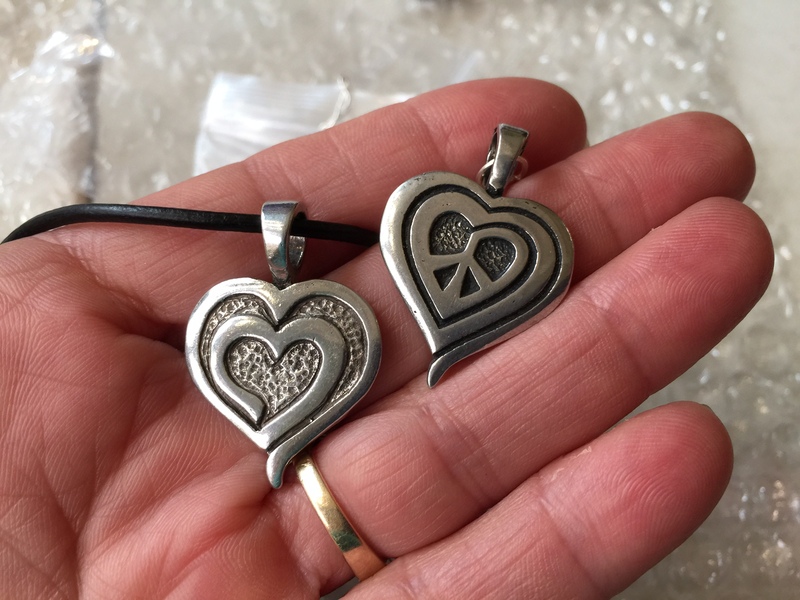 Eve’s Heart Jewelry, Co-created with Deva Designs…. 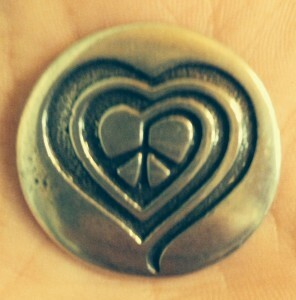 Eve’s Heart Bracelet (Pewter) $20. New in 2016! 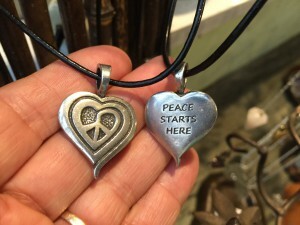 Eve’s Heart Logo and Peace Starts Here Pendants!